I used buttercream icing on the entire cake and a cake recipe I got from my old 1967 copy of The Joy of Cooking (which, by the way, was a GREAT recipe but unfortunately, I don't remember which one it was). I have also decided that I dislike black icing almost as much as red. 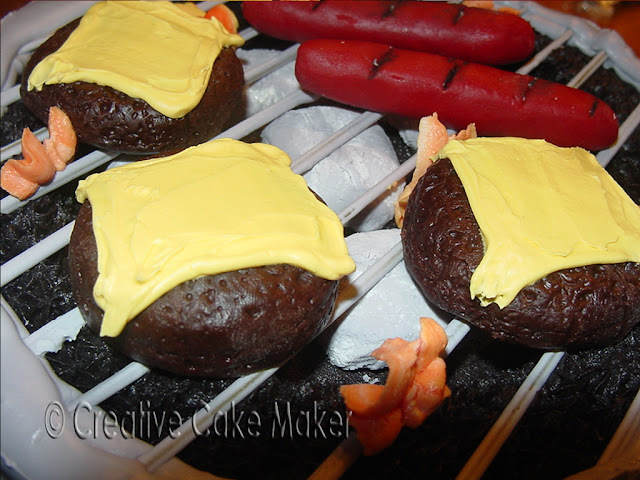 The burgers and hot dogs are made out of Wilton Candy Clay. The hot dogs were hand molded and the burger patties are formed using a heavily scrubbed Playdoh mold. The cheese slices are just melted candy melts spread on the burger patties. Tristan loved this cake because he thought the "flames" were actually grilled shrimp - and he loves his shrimp! I didn't actually get to go to my father-in-law's birthday party (had to work) so Will got to drive the cake to their house and worry about having the cake slide around the floorboard of the car the whole way there (in it's carrying container, of course). I heard it arrived just fine and everyone loved it. YOUR cake is MUCH better than theirs !!! I have tried the cocoa powder, but I needed so much of it to make a difference in how much black coloring I needed (while still keeping the texture and taste right) That I got fed up with it. Hey! 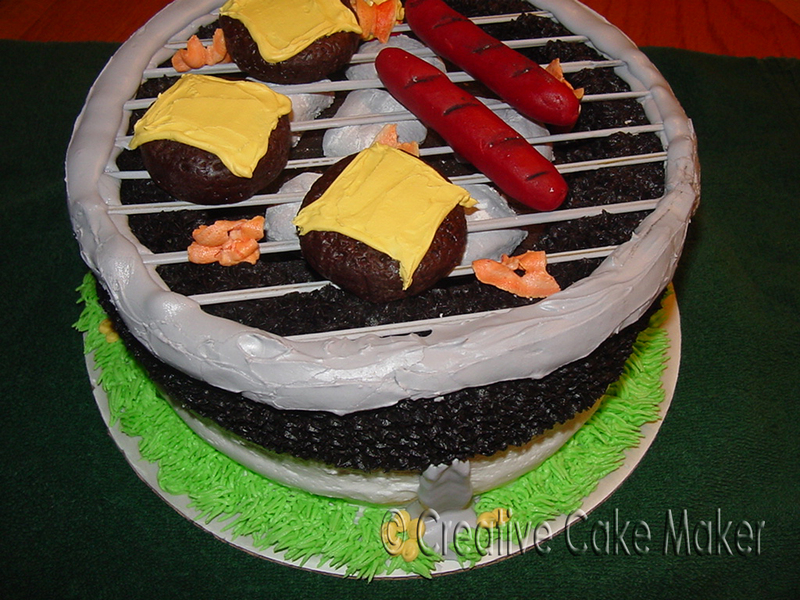 I am so excited to find a cute cake for my son's birthday who asked for a cookout party and a grill cake! I thought I would never find anything worth while, but this looks great! I wanted to see if you had the recipe for the cake from the 1967 cookbook you referenced? I looked quickly on your site and didn't see it. Thanks for your help!